I’ve been busy scrapping when I’m blocked at Qwyzzle…. I don’t really want to blab on much today, so lets just get into it, ok? Papers are from Jen Wilson’s Layers upon layers collection, Morning Breeze. Gorgeous blues and patterns. Stitching is from Dani Mogstad’s Fab fall embellishments. Inked edge action from AtomicCupcake.com. Fonts used are Another Typewriter and Mark. Papers from Jen Wilson’s new Layers upon Layers collection, this is Seafoam Memoirs. Love this mix of minty green and pink. Frame and M stamp from ScrapArtist.com schmootzy frames and stamps. Stitching is from Kim Liddiard’s Sweet freebie, recoloured. Fonts used are Typewriter, Texas Hero and Stamp Act. Created in PS7. Background paper is Jen Wilson’s Innocent cream paper, other paper and elements (including the stitching) from Kim Christensen’s Dirty Shirt pack. Acrylic Alpha from Dani Mogstad. Fonts used are BN Pinky and Typewriter. Created in PS7. Papers and elements from Kim Christensen’s Dirty Shirt set. Flowers (recoloured) and centres from Jen Wilson’s Scrapstreet flower shop. 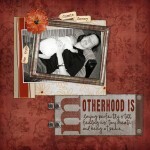 Schmootzy alpha stamps from Nancie Rowe Janitz at ScrapArtist. Inked edge action from AtomicCupcake.com. Fonts used are CBX Labelmaker and FB Sprinkles. Created in PS7. Otherwise, I’ve got more cupboard cleaning out to do, and will catch you all later! WOW hun these are AWESOME!!!! WOW Cassie you are creating some AMAZING layouts. They are all so fantastic and different, something I struggle with. OK I am off to scrap!